BOOK 1: DRAGONS LOST: The kingdom of dragons is all but forgotten. The Cured Temple now rules over the ashes of that lost realm. Yet some still carry the dragon magic. Some still whisper the forbidden word: "Requiem..."
BOOK 2: DRAGONS REBORN: The last dragons in the world, only a handful of souls, bind together. They fly again. They fight the Cured Temple. They cry out in the open sky: "Remember Requiem!" BOOK 3: DRAGONS RISING: The Cured Temple's armies swarm across land, sea, and sky. 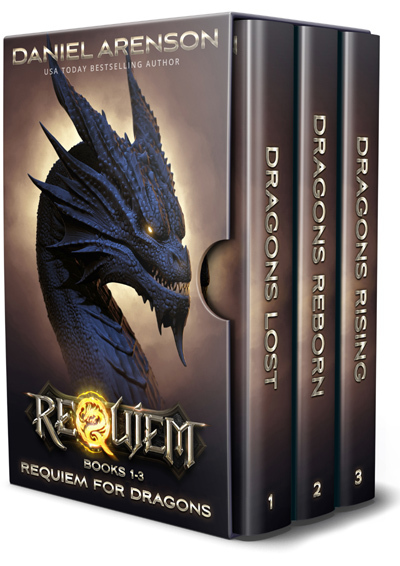 The world's last dragons fly to face them... vowing to defeat the Temple and see Requiem rise again.